For the official language of China, Taiwan and Singapore, also known as Mandarin, see Standard Chinese. For other languages spoken in China, see Languages of China. Unless otherwise specified, Chinese in this article is written in simplified Chinese/traditional Chinese; Pinyin order. If the simplified and traditional characters are the same, they are written only once. "Han language" redirects here. For the Athabaskan language, see Hän language. Chinese (simplified Chinese: 汉语; traditional Chinese: 漢語; pinyin: Hànyǔ; literally: 'Han language'; or especially though not exclusively for written Chinese: 中文; Zhōngwén; 'Chinese writing') is a group of related, but in many cases not mutually intelligible, language varieties, forming the Sinitic branch of the Sino-Tibetan language family. Chinese is spoken by the ethnic Chinese majority and many minority ethnic groups in China. About 1.2 billion people (around 16% of the world's population) speak some form of Chinese as their first language. The varieties of Chinese are usually described by native speakers as dialects of a single Chinese language, but linguists note that they are as diverse as a language family. [b] The internal diversity of Chinese has been likened to that of the Romance languages, but may be even more varied. There are between 7 and 13 main regional groups of Chinese (depending on classification scheme), of which the most spoken by far is Mandarin (about 960 million, e.g. Southwestern Mandarin), followed by Wu (80 million, e.g. Shanghainese), Min (70 million, e.g. Southern Min), Yue (60 million, e.g. Cantonese), etc. Most of these groups are mutually unintelligible, and even dialect groups within Min Chinese may not be mutually intelligible. Some, however, like Xiang and certain Southwest Mandarin dialects, may share common terms and a certain degree of intelligibility. All varieties of Chinese are tonal and analytic. Standard Chinese (Pǔtōnghuà/Guóyǔ/Huáyǔ) is a standardized form of spoken Chinese based on the Beijing dialect of Mandarin. It is the official language of China and Taiwan, as well as one of the four official languages of Singapore. It is one of the six official languages of the United Nations. The written form of the standard language (中文; Zhōngwén), based on the logograms known as Chinese characters (汉字/漢字; Hànzì), is shared by literate speakers of otherwise unintelligible dialects. The earliest Chinese written records are Shang dynasty-era oracle inscriptions, which can be traced back to 1250 BCE. The phonetic categories of Archaic Chinese can be reconstructed from the rhymes of ancient poetry. During the Northern and Southern dynasties period, Middle Chinese went through several sound changes and split into several varieties following prolonged geographic and political separation. Qieyun, a rime dictionary, recorded a compromise between the pronunciations of different regions. The royal courts of the Ming and early Qing dynasties operated using a koiné language (Guanhua) based on Nanjing dialect of Lower Yangtze Mandarin. Standard Chinese was adopted in the 1930s, and is now the official language of both the People's Republic of China and the Republic of China on Taiwan. Most linguists classify all varieties of Chinese as part of the Sino-Tibetan language family, together with Burmese, Tibetan and many other languages spoken in the Himalayas and the Southeast Asian Massif. Although the relationship was first proposed in the early 19th century and is now broadly accepted, reconstruction of Sino-Tibetan is much less developed than that of families such as Indo-European or Austroasiatic. Difficulties have included the great diversity of the languages, the lack of inflection in many of them, and the effects of language contact. In addition, many of the smaller languages are spoken in mountainous areas that are difficult to reach, and are often also sensitive border zones. Without a secure reconstruction of proto-Sino-Tibetan, the higher-level structure of the family remains unclear. A top-level branching into Chinese and Tibeto-Burman languages is often assumed, but has not been convincingly demonstrated. The first written records appeared over 3,000 years ago during the Shang dynasty. As the language evolved over this period, the various local varieties became mutually unintelligible. In reaction, central governments have repeatedly sought to promulgate a unified standard. The earliest examples of Chinese are divinatory inscriptions on oracle bones from around 1250 BCE in the late Shang dynasty. Old Chinese was the language of the Western Zhou period (1046–771 BCE), recorded in inscriptions on bronze artifacts, the Classic of Poetry and portions of the Book of Documents and I Ching. Scholars have attempted to reconstruct the phonology of Old Chinese by comparing later varieties of Chinese with the rhyming practice of the Classic of Poetry and the phonetic elements found in the majority of Chinese characters. Although many of the finer details remain unclear, most scholars agree that Old Chinese differs from Middle Chinese in lacking retroflex and palatal obstruents but having initial consonant clusters of some sort, and in having voiceless nasals and liquids. Most recent reconstructions also describe an atonal language with consonant clusters at the end of the syllable, developing into tone distinctions in Middle Chinese. Several derivational affixes have also been identified, but the language lacks inflection, and indicated grammatical relationships using word order and grammatical particles. Middle Chinese was the language used during Northern and Southern dynasties and the Sui, Tang, and Song dynasties (6th through 10th centuries CE). It can be divided into an early period, reflected by the Qieyun rime book (601 CE), and a late period in the 10th century, reflected by rhyme tables such as the Yunjing constructed by ancient Chinese philologists as a guide to the Qieyun system. These works define phonological categories, but with little hint of what sounds they represent. Linguists have identified these sounds by comparing the categories with pronunciations in modern varieties of Chinese, borrowed Chinese words in Japanese, Vietnamese, and Korean, and transcription evidence. The resulting system is very complex, with a large number of consonants and vowels, but they are probably not all distinguished in any single dialect. Most linguists now believe it represents a diasystem encompassing 6th-century northern and southern standards for reading the classics. The relationship between spoken and written Chinese is rather complex. Its spoken varieties have evolved at different rates, while written Chinese itself has changed much less. Classical Chinese literature began in the Spring and Autumn period. After the fall of the Northern Song dynasty, and during the reign of the Jin (Jurchen) and Yuan (Mongol) dynasties in northern China, a common speech (now called Old Mandarin) developed based on the dialects of the North China Plain around the capital. The Zhongyuan Yinyun (1324) was a dictionary that codified the rhyming conventions of new sanqu verse form in this language. Together with the slightly later Menggu Ziyun, this dictionary describes a language with many of the features characteristic of modern Mandarin dialects. Up to the early 20th century, most of the people in China spoke only their local variety. 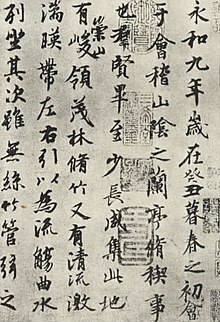 As a practical measure, officials of the Ming and Qing dynasties carried out the administration of the empire using a common language based on Mandarin varieties, known as Guānhuà (官话/官話, literally "language of officials"). For most of this period, this language was a koiné based on dialects spoken in the Nanjing area, though not identical to any single dialect. By the middle of the 19th century, the Beijing dialect had become dominant and was essential for any business with the imperial court. In the 1930s a standard national language Guóyǔ (国语/國語 "national language") was adopted. After much dispute between proponents of northern and southern dialects and an abortive attempt at an artificial pronunciation, the National Language Unification Commission finally settled on the Beijing dialect in 1932. The People's Republic founded in 1949 retained this standard, calling it pǔtōnghuà (普通话/普通話 "common speech"). The national language is now used in education, the media, and formal situations in both Mainland China and Taiwan. In Hong Kong and Macau, because of their colonial and linguistic history, the language used in education, the media, formal speech, and everyday life remains the local Cantonese, although the standard language has become very influential and is being taught in schools. The Chinese language has spread to neighbouring countries through a variety of means. Northern Vietnam was incorporated into the Han empire in 111 BCE, marking the beginning of a period of Chinese control that ran almost continuously for a millennium. The Four Commanderies were established in northern Korea in the first century BCE, but disintegrated in the following centuries. Chinese Buddhism spread over East Asia between the 2nd and 5th centuries CE, and with it the study of scriptures and literature in Literary Chinese. 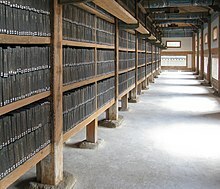 Later Korea, Japan, and Vietnam developed strong central governments modeled on Chinese institutions, with Literary Chinese as the language of administration and scholarship, a position it would retain until the late 19th century in Korea and (to a lesser extent) Japan, and the early 20th century in Vietnam. Scholars from different lands could communicate, albeit only in writing, using Literary Chinese. Although they used Chinese solely for written communication, each country had its own tradition of reading texts aloud, the so-called Sino-Xenic pronunciations. Chinese words with these pronunciations were also extensively imported into the Korean, Japanese and Vietnamese languages, and today comprise over half of their vocabularies. This massive influx led to changes in the phonological structure of the languages, contributing to the development of moraic structure in Japanese and the disruption of vowel harmony in Korean. Borrowed Chinese morphemes have been used extensively in all these languages to coin compound words for new concepts, in a similar way to the use of Latin and Ancient Greek roots in European languages. Many new compounds, or new meanings for old phrases, were created in the late 19th and early 20th centuries to name Western concepts and artifacts. These coinages, written in shared Chinese characters, have then been borrowed freely between languages. They have even been accepted into Chinese, a language usually resistant to loanwords, because their foreign origin was hidden by their written form. Often different compounds for the same concept were in circulation for some time before a winner emerged, and sometimes the final choice differed between countries. The proportion of vocabulary of Chinese origin thus tends to be greater in technical, abstract, or formal language. For example, in Japan, Sino-Japanese words account for about 35% of the words in entertainment magazines, over half the words in newspapers, and 60% of the words in science magazines. Vietnam, Korea, and Japan each developed writing systems for their own languages, initially based on Chinese characters, but later replaced with the Hangul alphabet for Korean and supplemented with kana syllabaries for Japanese, while Vietnamese continued to be written with the complex Chữ nôm script. However, these were limited to popular literature until the late 19th century. Today Japanese is written with a composite script using both Chinese characters (Kanji) and kana. Korean is written exclusively with Hangul in North Korea, and supplementary Chinese characters (Hanja) are increasingly rarely used in South Korea. Vietnamese is written with a Latin-based alphabet. Examples of loan words in English include "tea", from Hokkien (Min Nan) tê (茶), "dim sum", from Cantonese dim2 sam1 and "kumquat", from Cantonese gam1gwat1 (金橘). Jerry Norman estimated that there are hundreds of mutually unintelligible varieties of Chinese. These varieties form a dialect continuum, in which differences in speech generally become more pronounced as distances increase, though the rate of change varies immensely. Generally, mountainous South China exhibits more linguistic diversity than the North China Plain. In parts of South China, a major city's dialect may only be marginally intelligible to close neighbors. For instance, Wuzhou is about 120 miles (190 km) upstream from Guangzhou, but the Yue variety spoken there is more like that of Guangzhou than is that of Taishan, 60 miles (95 km) southwest of Guangzhou and separated from it by several rivers. In parts of Fujian the speech of neighboring counties or even villages may be mutually unintelligible. Until the late 20th century, Chinese emigrants to Southeast Asia and North America came from southeast coastal areas, where Min, Hakka, and Yue dialects are spoken. The vast majority of Chinese immigrants to North America spoke the Taishan dialect, from a small coastal area southwest of Guangzhou. Jin, previously included in Mandarin. Huizhou, previously included in Wu. Pinghua, previously included in Yue. Some varieties remain unclassified, including Danzhou dialect (spoken in Danzhou, on Hainan Island), Waxianghua (spoken in western Hunan) and Shaozhou Tuhua (spoken in northern Guangdong). Standard Chinese, often called Mandarin, is the official standard language of China and Taiwan, and one of the four official languages of Singapore (where it is called "Huáyŭ" 华语 or simply Chinese). Standard Chinese is based on the Beijing dialect, the dialect of Mandarin as spoken in Beijing. The governments of both China and Taiwan intend for speakers of all Chinese speech varieties to use it as a common language of communication. Therefore, it is used in government agencies, in the media, and as a language of instruction in schools. In mainland China and Taiwan, diglossia has been a common feature. For example, in addition to Standard Chinese, a resident of Shanghai might speak Shanghainese; and, if he or she grew up elsewhere, then he or she is also likely to be fluent in the particular dialect of that local area. A native of Guangzhou may speak both Cantonese and Standard Chinese. In addition to Mandarin, most Taiwanese also speak Minnan, Hakka, or an Austronesian language. A Taiwanese may commonly mix pronunciations, phrases, and words from Mandarin and other Taiwanese languages, and this mixture is considered normal in daily or informal speech. The official Chinese designation for the major branches of Chinese is fāngyán (方言, literally "regional speech"), whereas the more closely related varieties within these are called dìdiǎn fāngyán (地点方言/地點方言 "local speech"). Conventional English-language usage in Chinese linguistics is to use dialect for the speech of a particular place (regardless of status) and dialect group for a regional grouping such as Mandarin or Wu. Because varieties from different groups are not mutually intelligible, some scholars prefer to describe Wu and others as separate languages. [better source needed] Jerry Norman called this practice misleading, pointing out that Wu, which itself contains many mutually unintelligible varieties, could not be properly called a single language under the same criterion, and that the same is true for each of the other groups. Mutual intelligibility is considered by some linguists to be the main criterion for determining whether varieties are separate languages or dialects of a single language, although others do not regard it as decisive, particularly when cultural factors interfere as they do with Chinese. As Campbell (2008) explains, linguists often ignore mutual intelligibility when varieties share intelligibility with a central variety (i.e. prestige variety, such as Standard Mandarin), as the issue requires some careful handling when mutual intelligibility is inconsistent with language identity. John DeFrancis argues that it is inappropriate to refer to Mandarin, Wu and so on as "dialects" because the mutual unintelligibility between them is too great. On the other hand, he also objects to considering them as separate languages, as it incorrectly implies a set of disruptive "religious, economic, political, and other differences" between speakers that exist, for example, between French Catholics and English Protestants in Canada, but not between speakers of Cantonese and Mandarin in China, owing to China's near-uninterrupted history of centralized government. Because of the difficulties involved in determining the difference between language and dialect, other terms have been proposed: ISO 639-3 follows Ethnologue in assigning individual language codes to the 13 main subdivisions, while Chinese as a whole is classified as a 'macrolanguage'. Other options include vernacular, lect  regionalect, topolect, and variety. Most Chinese people consider the spoken varieties as one single language because speakers share a common culture and history, as well as a shared national identity and a common written form. To Chinese nationalists, the idea of Chinese as a language family may suggest that the Chinese identity is much more fragmented and disunified than it actually is and as such is often looked upon as culturally and politically provocative. Additionally, in Taiwan it is closely associated with Taiwanese independence, some of whose supporters promote the local Taiwanese Hokkien variety. The phonological structure of each syllable consists of a nucleus that has a vowel (which can be a monophthong, diphthong, or even a triphthong in certain varieties), preceded by an onset (a single consonant, or consonant+glide; zero onset is also possible), and followed (optionally) by a coda consonant; a syllable also carries a tone. There are some instances where a vowel is not used as a nucleus. An example of this is in Cantonese, where the nasal sonorant consonants /m/ and /ŋ/ can stand alone as their own syllable. In Mandarin much more than in other spoken varieties, most syllables tend to be open syllables, meaning they have no coda (assuming that a final glide is not analyzed as a coda), but syllables that do have codas are restricted to nasals /m/, /n/, /ŋ/, the retroflex approximant /ɻ /, and voiceless stops /p/, /t/, /k/, or /ʔ/. Some varieties allow most of these codas, whereas others, such as Standard Chinese, are limited to only /n/, /ŋ/ and /ɻ /. All varieties of spoken Chinese use tones to distinguish words. [d] A few dialects of north China may have as few as three tones, while some dialects in south China have up to 6 or 12 tones, depending on how one counts. One exception from this is Shanghainese which has reduced the set of tones to a two-toned pitch accent system much like modern Japanese. 妈/媽 mā high level "mother"
麻 má high rising "hemp"
马/馬 mǎ low falling-rising "horse"
骂/罵 mà high falling "scold"
诗/詩 si1 high level, high falling "poem"
史 si2 high rising "history"
弒 si3 mid level "to assassinate"
时/時 si4 low falling "time"
市 si5 low rising "market"
是 si6 low level "yes"
色 sik1 high level (stopped) "color"
锡/錫 sik3 mid level (stopped) "tin"
食 sik6 low level (stopped) "to eat"
Chinese is often described as a "monosyllabic" language. However, this is only partially correct. It is largely accurate when describing Classical Chinese and Middle Chinese; in Classical Chinese, for example, perhaps 90% of words correspond to a single syllable and a single character. In the modern varieties, it is usually the case that a morpheme (unit of meaning) is a single syllable; In contrast, English has plenty of multi-syllable morphemes, both bound and free, such as "seven", "elephant", "para-" and "-able". This phonological collapse has led to a corresponding increase in the number of homophones. As an example, the small Langenscheidt Pocket Chinese Dictionary lists six words that are commonly pronounced as shí (tone 2): 十 "ten"; 实/實 "real, actual"; 识/識 "know (a person), recognize"; 石 "stone"; 时/時 "time"; 食 "food, eat". These were all pronounced differently in Early Middle Chinese; in William H. Baxter's transcription they were dzyip, zyit, syik, dzyek, dzyi and zyik respectively. They are still pronounced differently in today's Cantonese; in Jyutping they are sap9, sat9, sik7, sek9, si4, sik9. In modern spoken Mandarin, however, tremendous ambiguity would result if all of these words could be used as-is; Yuen Ren Chao's modern poem Lion-Eating Poet in the Stone Den exploits this, consisting of 92 characters all pronounced shi. As such, most of these words have been replaced (in speech, if not in writing) with a longer, less-ambiguous compound. Only the first one, 十 "ten", normally appears as such when spoken; the rest are normally replaced with, respectively, shíjì 实际/實際 (lit. "actual-connection"); rènshi 认识/認識 (lit. "recognize-know"); shítou 石头/石頭 (lit. "stone-head"); shíjiān 时间/時間 (lit. "time-interval"); shíwù 食物 (lit. "food-thing"). In each case, the homophone was disambiguated by adding another morpheme, typically either a synonym or a generic word of some sort (for example, "head", "thing"), the purpose of which is simply to indicate which of the possible meanings of the other, homophonic syllable should be selected. However, when one of the above words forms part of a compound, the disambiguating syllable is generally dropped and the resulting word is still disyllabic. For example, shí 石 alone, not shítou 石头/石頭, appears in compounds meaning "stone-", for example, shígāo 石膏 "plaster" (lit. "stone cream"), shíhuī 石灰 "lime" (lit. "stone dust"), shíkū 石窟 "grotto" (lit. "stone cave"), shíyīng 石英 "quartz" (lit. "stone flower"), shíyóu 石油 "petroleum" (lit. "stone oil"). Most modern varieties of Chinese have the tendency to form new words through disyllabic, trisyllabic and tetra-character compounds. In some cases, monosyllabic words have become disyllabic without compounding, as in kūlong 窟窿 from kǒng 孔; this is especially common in Jin. Chinese morphology is strictly bound to a set number of syllables with a fairly rigid construction. Although many of these single-syllable morphemes (zì, 字) can stand alone as individual words, they more often than not form multi-syllabic compounds, known as cí (词/詞), which more closely resembles the traditional Western notion of a word. A Chinese cí ("word") can consist of more than one character-morpheme, usually two, but there can be three or more. hànbǎobāo, hànbǎo 汉堡包/漢堡包, 汉堡/漢堡 – "hamburger"
wǒ 我 – "I, me"
rén 人 – "people, human, mankind"
dìqiú 地球 – "The Earth"
They make heavy use of grammatical particles to indicate aspect and mood. In Mandarin Chinese, this involves the use of particles like le 了 (perfective), hái 还/還 ("still"), yǐjīng 已经/已經 ("already"), and so on. Chinese has a subject–verb–object word order, and like many other languages of East Asia, makes frequent use of the topic–comment construction to form sentences. Chinese also has an extensive system of classifiers and measure words, another trait shared with neighboring languages like Japanese and Korean. Other notable grammatical features common to all the spoken varieties of Chinese include the use of serial verb construction, pronoun dropping and the related subject dropping. Although the grammars of the spoken varieties share many traits, they do possess differences. The entire Chinese character corpus since antiquity comprises well over 20,000 characters, of which only roughly 10,000 are now commonly in use. However Chinese characters should not be confused with Chinese words. Because most Chinese words are made up of two or more characters, there are many more Chinese words than characters. A more accurate equivalent for a Chinese character is the morpheme, as characters represent the smallest grammatical units with individual meanings in the Chinese language. Estimates of the total number of Chinese words and lexicalized phrases vary greatly. The Hanyu Da Zidian, a compendium of Chinese characters, includes 54,678 head entries for characters, including bone oracle versions. The Zhonghua Zihai (1994) contains 85,568 head entries for character definitions, and is the largest reference work based purely on character and its literary variants. The CC-CEDICT project (2010) contains 97,404 contemporary entries including idioms, technology terms and names of political figures, businesses and products. The 2009 version of the Webster's Digital Chinese Dictionary (WDCD), based on CC-CEDICT, contains over 84,000 entries. The most comprehensive pure linguistic Chinese-language dictionary, the 12-volume Hanyu Da Cidian, records more than 23,000 head Chinese characters and gives over 370,000 definitions. The 1999 revised Cihai, a multi-volume encyclopedic dictionary reference work, gives 122,836 vocabulary entry definitions under 19,485 Chinese characters, including proper names, phrases and common zoological, geographical, sociological, scientific and technical terms. The 7th (2016) edition of Xiandai Hanyu Cidian, an authoritative one-volume dictionary on modern standard Chinese language as used in mainland China, has 13,000 head characters and defines 70,000 words. Like any other language, Chinese has absorbed a sizable number of loanwords from other cultures. Most Chinese words are formed out of native Chinese morphemes, including words describing imported objects and ideas. However, direct phonetic borrowing of foreign words has gone on since ancient times. Some early Indo-European loanwords in Chinese have been proposed, notably 蜜 mì "honey", 狮/獅 shī "lion," and perhaps also 马/馬 mǎ "horse", 猪/豬 zhū "pig", 犬 quǎn "dog", and 鹅/鵝 é "goose". [f] Ancient words borrowed from along the Silk Road since Old Chinese include 葡萄 pútáo "grape", 石榴 shíliu/shíliú "pomegranate" and 狮子/獅子 shīzi "lion". Some words were borrowed from Buddhist scriptures, including 佛 Fó "Buddha" and 菩萨/菩薩 Púsà "bodhisattva." Other words came from nomadic peoples to the north, such as 胡同 hútòng "hutong". Words borrowed from the peoples along the Silk Road, such as 葡萄 "grape," generally have Persian etymologies. Buddhist terminology is generally derived from Sanskrit or Pāli, the liturgical languages of North India. Words borrowed from the nomadic tribes of the Gobi, Mongolian or northeast regions generally have Altaic etymologies, such as 琵琶 pípá, the Chinese lute, or 酪 lào/luò "cheese" or "yoghurt", but from exactly which source is not always clear. Modern neologisms are primarily translated into Chinese in one of three ways: free translation (calque, or by meaning), phonetic translation (by sound), or a combination of the two. Today, it is much more common to use existing Chinese morphemes to coin new words in order to represent imported concepts, such as technical expressions and international scientific vocabulary. Any Latin or Greek etymologies are dropped and converted into the corresponding Chinese characters (for example, anti- typically becomes "反", literally opposite), making them more comprehensible for Chinese but introducing more difficulties in understanding foreign texts. For example, the word telephone was loaned phonetically as 德律风/德律風 (Shanghainese: télífon [təlɪfoŋ], Mandarin: délǜfēng) during the 1920s and widely used in Shanghai, but later 电话/電話 diànhuà (lit. "electric speech"), built out of native Chinese morphemes, became prevalent (電話 is in fact from the Japanese 電話 denwa; see below for more Japanese loans). Other examples include 电视/電視 diànshì (lit. "electric vision") for television, 电脑/電腦 diànnǎo (lit. "electric brain") for computer; 手机/手機 shǒujī (lit. "hand machine") for mobile phone, 蓝牙/藍牙 lányá (lit. "blue tooth") for Bluetooth, and 网志/網誌 wǎngzhì (lit. "internet logbook") for blog in Hong Kong and Macau Cantonese. Occasionally half-transliteration, half-translation compromises are accepted, such as 汉堡包/漢堡包 hànbǎobāo (漢堡 hànbǎo "Hamburg" + 包 bāo "bun") for "hamburger". Sometimes translations are designed so that they sound like the original while incorporating Chinese morphemes (phono-semantic matching), such as 拖拉机/拖拉機 tuōlājī "tractor" (lit. "dragging-pulling machine"), or 马利奥/馬利奧 Mǎlì'ào for the video game character Mario. This is often done for commercial purposes, for example 奔腾/奔騰 bēnténg (lit. "dashing-leaping") for Pentium and 赛百味/賽百味 Sàibǎiwèi (lit. "better-than hundred tastes") for Subway restaurants. Foreign words, mainly proper nouns, continue to enter the Chinese language by transcription according to their pronunciations. This is done by employing Chinese characters with similar pronunciations. For example, "Israel" becomes 以色列 Yǐsèliè, "Paris" becomes 巴黎 Bālí. A rather small number of direct transliterations have survived as common words, including 沙发/沙發 shāfā "sofa", 马达/馬達 mǎdá "motor", 幽默 yōumò "humor", 逻辑/邏輯 luóji/luójí "logic", 时髦/時髦 shímáo "smart, fashionable", and 歇斯底里 xiēsīdǐlǐ "hysterics". The bulk of these words were originally coined in the Shanghai dialect during the early 20th century and were later loaned into Mandarin, hence their pronunciations in Mandarin may be quite off from the English. For example, 沙发/沙發 "sofa" and 马达/馬達 "motor" in Shanghainese sound more like their English counterparts. Cantonese differs from Mandarin with some transliterations, such as 梳化 so1 faa3*2 "sofa" and 摩打 mo1 daa2 "motor". Western foreign words representing Western concepts have influenced Chinese since the 20th century through transcription. From French came 芭蕾 bālěi "ballet" and 香槟 xiāngbīn, "champagne"; from Italian, 咖啡 kāfēi "caffè". English influence is particularly pronounced. From early 20th century Shanghainese, many English words are borrowed, such as 高尔夫/高爾夫 gāoěrfū "golf" and the above-mentioned 沙发/沙發 shāfā "sofa". Later, the United States soft influences gave rise to 迪斯科 dísikē/dísīkē "disco", 可乐/可樂 kělè "cola", and 迷你 mínǐ "mini [skirt]". Contemporary colloquial Cantonese has distinct loanwords from English, such as 卡通 kaa1 tung1 "cartoon", 基佬 gei1 lou2 "gay people", 的士 dik1 si6*2 "taxi", and 巴士 baa1 si6*2 "bus". With the rising popularity of the Internet, there is a current vogue in China for coining English transliterations, for example, 粉丝/粉絲 fěnsī "fans", 黑客 hēikè "hacker" (lit. "black guest"), and 博客 bókè "blog". In Taiwan, some of these transliterations are different, such as 駭客 hàikè for "hacker" and 部落格 bùluògé for "blog" (lit. "interconnected tribes"). Another result of the English influence on Chinese is the appearance in Modern Chinese texts of so-called 字母词/字母詞 zìmǔcí (lit. "lettered words") spelled with letters from the English alphabet. This has appeared in magazines, newspapers, on web sites, and on TV: 三G手机/三G手機 "3rd generation cell phones" (三 sān "three" + G "generation" + 手机/手機 shǒujī "mobile phones"), IT界 "IT circles" (IT "information technology" + 界 jiè "industry"), HSK (Hànyǔ Shuǐpíng Kǎoshì, 汉语水平考试/漢語水平考試), GB (Guóbiāo, 国标/國標), CIF价/CIF價 (CIF "Cost, Insurance, Freight" + 价/價 jià "price"), e家庭 "e-home" (e "electronic" + 家庭 jiātíng "home"), Chinese: W时代/Chinese: W時代 "wireless era" (W "wireless" + 时代/時代 shídài "era"), TV族 "TV watchers" (TV "television" + 族 zú "social group; clan"), 后РС时代/後PC時代 "post-PC era" (后/後 hòu "after/post-" + PC "personal computer" + 时代/時代), and so on. Since the 20th century, another source of words has been Japanese using existing kanji (Chinese characters used in Japanese). Japanese re-molded European concepts and inventions into wasei-kango (和製漢語, lit. "Japanese-made Chinese"), and many of these words have been re-loaned into modern Chinese. Other terms were coined by the Japanese by giving new senses to existing Chinese terms or by referring to expressions used in classical Chinese literature. For example, jīngjì (经济/經濟; 経済 keizai in Japanese), which in the original Chinese meant "the workings of the state", was narrowed to "economy" in Japanese; this narrowed definition was then re-imported into Chinese. As a result, these terms are virtually indistinguishable from native Chinese words: indeed, there is some dispute over some of these terms as to whether the Japanese or Chinese coined them first. As a result of this loaning, Chinese, Korean, Japanese, and Vietnamese share a corpus of linguistic terms describing modern terminology, paralleling the similar corpus of terms built from Greco-Latin and shared among European languages. The Chinese orthography centers on Chinese characters, which are written within imaginary square blocks, traditionally arranged in vertical columns, read from top to bottom down a column, and right to left across columns. Chinese characters denote morphemes independent of phonetic change. Thus the character 一 ("one") is uttered yī in Standard Chinese, yat1 in Cantonese and it in Hokkien (form of Min). Vocabularies from different major Chinese variants have diverged, and colloquial nonstandard written Chinese often makes use of unique "dialectal characters", such as 冇 and 係 for Cantonese and Hakka, which are considered archaic or unused in standard written Chinese. Written colloquial Cantonese has become quite popular in online chat rooms and instant messaging amongst Hong-Kongers and Cantonese-speakers elsewhere. It is considered highly informal, and does not extend to many formal occasions. The Chinese had no uniform phonetic transcription system until the mid-20th century, although enunciation patterns were recorded in early rime books and dictionaries. Early Indian translators, working in Sanskrit and Pali, were the first to attempt to describe the sounds and enunciation patterns of Chinese in a foreign language. After the 15th century, the efforts of Jesuits and Western court missionaries resulted in some rudimentary Latin transcription systems, based on the Nanjing Mandarin dialect. In Hunan, women in certain areas write their local language in Nü Shu, a syllabary derived from Chinese characters. The Dungan language, considered by many a dialect of Mandarin, is nowadays written in Cyrillic, and was previously written in the Arabic script. The Dungan people are primarily Muslim and live mainly in Kazakhstan, Kyrgyzstan, and Russia; some of the related Hui people also speak the language and live mainly in China. Each Chinese character represents a monosyllabic Chinese word or morpheme. In 100 CE, the famed Han dynasty scholar Xu Shen classified characters into six categories, namely pictographs, simple ideographs, compound ideographs, phonetic loans, phonetic compounds and derivative characters. Of these, only 4% were categorized as pictographs, including many of the simplest characters, such as rén 人 (human), rì 日 (sun), shān 山 (mountain; hill), shuǐ 水 (water). Between 80% and 90% were classified as phonetic compounds such as chōng 沖 (pour), combining a phonetic component zhōng 中 (middle) with a semantic radical 氵 (water). Almost all characters created since have been made using this format. The 18th-century Kangxi Dictionary recognized 214 radicals. Modern characters are styled after the regular script. Various other written styles are also used in Chinese calligraphy, including seal script, cursive script and clerical script. Calligraphy artists can write in traditional and simplified characters, but they tend to use traditional characters for traditional art. There are currently two systems for Chinese characters. The traditional system, used in Hong Kong, Taiwan, Macau and Chinese speaking communities (except Singapore and Malaysia) outside mainland China, takes its form from standardized character forms dating back to the late Han dynasty. The Simplified Chinese character system, introduced by the People's Republic of China in 1954 to promote mass literacy, simplifies most complex traditional glyphs to fewer strokes, many to common cursive shorthand variants. Singapore, which has a large Chinese community, was the second nation to officially adopt simplified characters, although it has also become the de facto standard for younger ethnic Chinese in Malaysia. The Internet provides the platform to practice reading these alternative systems, be it traditional or simplified. A well-educated Chinese reader today recognizes approximately 4,000 to 6,000 characters; approximately 3,000 characters are required to read a Mainland newspaper. The PRC government defines literacy amongst workers as a knowledge of 2,000 characters, though this would be only functional literacy. School-children typically learn around 2,000 characters whereas scholars may memorize up to 10,000. A large unabridged dictionary, like the Kangxi Dictionary, contains over 40,000 characters, including obscure, variant, rare, and archaic characters; fewer than a quarter of these characters are now commonly used. "National language" (國語/国语; Guóyǔ) written in Traditional and Simplified Chinese characters, followed by various romanizations. Romanization is the process of transcribing a language into the Latin script. There are many systems of romanization for the Chinese varieties, due to the lack of a native phonetic transcription until modern times. Chinese is first known to have been written in Latin characters by Western Christian missionaries in the 16th century. Today the most common romanization standard for Standard Chinese is Hanyu Pinyin, often known simply as pinyin, introduced in 1956 by the People's Republic of China, and later adopted by Singapore and Taiwan. Pinyin is almost universally employed now for teaching standard spoken Chinese in schools and universities across America, Australia and Europe. Chinese parents also use Pinyin to teach their children the sounds and tones of new words. 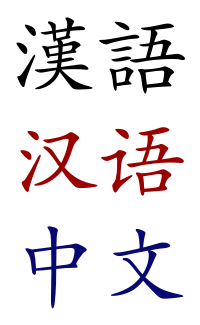 In school books that teach Chinese, the Pinyin romanization is often shown below a picture of the thing the word represents, with the Chinese character alongside. The second-most common romanization system, the Wade–Giles, was invented by Thomas Wade in 1859 and modified by Herbert Giles in 1892. As this system approximates the phonology of Mandarin Chinese into English consonants and vowels, i.e. it is an Anglicization, it may be particularly helpful for beginner Chinese speakers of an English-speaking background. Wade–Giles was found in academic use in the United States, particularly before the 1980s, and until 2009 was widely used in Taiwan. When used within European texts, the tone transcriptions in both pinyin and Wade–Giles are often left out for simplicity; Wade–Giles' extensive use of apostrophes is also usually omitted. Thus, most Western readers will be much more familiar with Beijing than they will be with Běijīng (pinyin), and with Taipei than T'ai²-pei³ (Wade–Giles). This simplification presents syllables as homophones which really are none, and therefore exaggerates the number of homophones almost by a factor of four. Other systems of romanization for Chinese include Gwoyeu Romatzyh, the French EFEO, the Yale system (invented during WWII for U.S. troops), as well as separate systems for Cantonese, Min Nan, Hakka, and other Chinese varieties. Chinese varieties have been phonetically transcribed into many other writing systems over the centuries. The 'Phags-pa script, for example, has been very helpful in reconstructing the pronunciations of premodern forms of Chinese. There are also at least two systems of cyrillization for Chinese. The most widespread is the Palladius system. Yang Lingfu, former curator of the National Museum of China, giving Chinese language instruction at the Civil Affairs Staging Area in 1945. With the growing importance and influence of China's economy globally, Mandarin instruction is gaining popularity in schools in the United States, and has become an increasingly popular subject of study amongst the young in the Western world, as in the UK. In 1991 there were 2,000 foreign learners taking China's official Chinese Proficiency Test (also known as HSK, comparable to the English Cambridge Certificate), while in 2005, the number of candidates had risen sharply to 117,660. By 2010, 750,000 people had taken the Chinese Proficiency Test. By 2017, 6.5 million candidates had taken the Chinese Proficiency Test of various kinds. According to the Modern Language Association, there were 550 elementary, junior high and senior high schools providing Chinese programs in the United States in 2015, which represented a 100% increase in two years. At the same time, enrollment in Chinese language classes at college level had an increase of 51% from 2002 to 2015. On the other hand, the American Council on the Teaching of Foreign Languages also had figures suggesting that 30,000 – 50,000 students were studying Chinese in 2015. In 2016, more than half a million Chinese students pursued post-secondary education overseas, whereas 400,000 international students came to China for higher education. Tsinghua University hosted 35,000 students from 116 countries in the same year. With the increase in demand for Chinese as a second language, there are 330 institutions teaching Chinese language globally according to the Chinese Ministry of Education. The establishment of Confucius Institutes, which are the public institutions affiliated with the Ministry of Education of China, aims at promoting Chinese language and culture as well as supporting Chinese teaching overseas. There were more than 480 Confucius Institutes worldwide as of 2014. ^ No specific variety of Chinese is official in Hong Kong and Macau. Residents predominantly speak Cantonese and use traditional Chinese characters, the de facto regional standard. Standard Mandarin and simplified Chinese characters as the national standard are also used in some official and educational settings. The HK SAR Government promotes 两文三語 [Bi-literacy (Chinese, English) and Tri-lingualism (Cantonese, Mandarin, English)], while the Macau SAR Government promotes 三文四語 [Tri-literacy (Chinese, Portuguese, English) and Quad-lingualism (Cantonese, Mandarin, Portuguese, English)], especially in public education. David Crystal, The Cambridge Encyclopedia of Language (Cambridge: Cambridge University Press, 1987), p. 312. "The mutual unintelligibility of the varieties is the main ground for referring to them as separate languages." Charles N. Li, Sandra A. Thompson. Mandarin Chinese: A Functional Reference Grammar (1989), p. 2. "The Chinese language family is genetically classified as an independent branch of the Sino-Tibetan language family." Norman (1988), p. 1. "[...] the modern Chinese dialects are really more like a family of languages [...]"
DeFrancis (1984), p. 56. "To call Chinese a single language composed of dialects with varying degrees of difference is to mislead by minimizing disparities that according to Chao are as great as those between English and Dutch. To call Chinese a family of languages is to suggest extralinguistic differences that in fact do not exist and to overlook the unique linguistic situation that exists in China." ^ a b DeFrancis (1984), p. 42 counts Chinese as having 1,277 tonal syllables, and about 398 to 418 if tones are disregarded; he cites Jespersen, Otto (1928) Monosyllabism in English; London, p. 15 for a count of over 8000 syllables for English. ^ A word pronounced in a wrong tone or inaccurate tone sounds as puzzling as if one said bud in English, meaning 'not good' or 'the thing one sleeps in.'" ^ A distinction is made between 他 as "he" and 她 as "she" in writing, but this is a 20th-century introduction, and both characters are pronounced in exactly the same way. ^ Encyclopædia Britannica s.v. "Chinese languages": "Old Chinese vocabulary already contained many words not generally occurring in the other Sino-Tibetan languages. The words for 'honey' and 'lion', and probably also 'horse', 'dog', and 'goose', are connected with Indo-European and were acquired through trade and early contacts. (The nearest known Indo-European languages were Tocharian and Sogdian, a middle Iranian language.) A number of words have Austroasiatic cognates and point to early contacts with the ancestral language of Muong–Vietnamese and Mon–Khmer. "; Jan Ulenbrook, Einige Übereinstimmungen zwischen dem Chinesischen und dem Indogermanischen (1967) proposes 57 items; see also Tsung-tung Chang, 1988 Indo-European Vocabulary in Old Chinese. ^ a b Chinese Academy of Social Sciences (2012), p. 3. ^ Mair (1991), pp. 10, 21. ^ Norman (1988), pp. 12–13. ^ Handel (2008), pp. 422, 434–436. ^ Handel (2008), p. 426. ^ Handel (2008), p. 431. ^ Norman (1988), pp. 183–185. ^ Schuessler (2007), p. 1. ^ Baxter (1992), pp. 2–3. ^ Norman (1988), pp. 42–45. ^ Baxter (1992), p. 177. ^ Baxter (1992), pp. 181–183. ^ Schuessler (2007), p. 12. ^ Baxter (1992), pp. 14–15. ^ Ramsey (1987), p. 125. ^ Norman (1988), pp. 34–42. ^ Norman (1988), p. 24. ^ Norman (1988), p. 48. ^ Norman (1988), pp. 48–49. ^ Norman (1988), pp. 49–51. ^ Norman (1988), pp. 133, 247. ^ Norman (1988), p. 136. ^ Coblin (2000), pp. 549–550. ^ Coblin (2000), pp. 540–541. ^ Ramsey (1987), pp. 3–15. ^ Norman (1988), p. 133. ^ Zhang & Yang (2004). ^ Sohn & Lee (2003), p. 23. ^ Miller (1967), pp. 29–30. ^ Kornicki (2011), pp. 75–77. ^ Kornicki (2011), p. 67. ^ Miyake (2004), pp. 98–99. ^ Shibatani (1990), pp. 120–121. ^ Sohn (2001), p. 89. ^ Shibatani (1990), p. 146. ^ Wilkinson (2000), p. 43. ^ Shibatani (1990), p. 143. ^ a b Wurm et al. (1987). ^ a b c Norman (2003), p. 72. ^ Norman (1988), pp. 189–190. ^ Ramsey (1987), p. 23. ^ Norman (1988), p. 188. ^ Norman (1988), p. 191. ^ Ramsey (1987), p. 98. ^ Norman (1988), p. 181. ^ Kurpaska (2010), pp. 53–55. ^ Kurpaska (2010), pp. 55–56. ^ Kurpaska (2010), pp. 72–73. ^ Klöter, Henning (2004). "Language Policy in the KMT and DPP eras". China Perspectives. 56. ISSN 1996-4617. Retrieved 30 May 2015. ^ Kuo, Yun-Hsuan (2005). New dialect formation : the case of Taiwanese Mandarin (PhD). University of Essex. Retrieved 26 June 2015. ^ a b DeFrancis (1984), p. 57. ^ Thomason (1988), pp. 27–28. ^ Mair (1991), p. 17. ^ DeFrancis (1984), p. 54. ^ Romaine (2000), pp. 13, 23. ^ Wardaugh & Fuller (2014), pp. 28–32. ^ Liang (2014), pp. 11–14. ^ Hymes (1971), p. 64. ^ Thomason (1988), p. 27. ^ Campbell (2008), p. 637. ^ DeFrancis (1984), pp. 55–57. ^ Lewis, Simons & Fennig (2015). ^ Haugen (1966), p. 927. ^ Mair (1991), p. 7. ^ Hudson (1996), p. 22. ^ Baxter (1992), p. 7–8. ^ Norman (1988), p. 52. ^ Chao (1948), p. 24. ^ Matthews & Yip (1994), pp. 20–22. ^ Terrell, Peter, ed. (2005). Langenscheidt Pocket Chinese Dictionary. Berlin and Munich: Langenscheidt KG. ISBN 978-1-58573-057-5. ^ Norman (1988), p. 10. ^ Kane (2006), p. 161. ^ Zimmermann, Basile (2010). "Redesigning Culture: Chinese Characters in Alphabet-Encoded Networks". Design and Culture. 2 (1). ^ "How hard is it to learn Chinese?". BBC News. January 17, 2006. Retrieved April 28, 2010. ^ (in Chinese) "汉语水平考试中心：2005年外国考生总人数近12万",Gov.cn Xinhua News Agency, January 16, 2006. ^ a b "Chinese as a second language growing in popularity". CGTN America. 2015-03-03. Retrieved 2017-07-29. ^ "China is third most popular destination for international students". CGTN America. 2017-03-18. Retrieved 2017-07-29. Campbell, Lyle (2008), "[Untitled review of Ethnologue, 15th edition]", Language, 84 (3): 636–641, doi:10.1353/lan.0.0054. Chappell, Hilary (2008), "Variation in the grammaticalization of complementizers from verba dicendi in Sinitic languages", Linguistic Typology, 12 (1): 45–98, doi:10.1515/lity.2008.032. Chinese Academy of Social Sciences (2012), Zhōngguó yǔyán dìtú jí (dì 2 bǎn): Hànyǔ fāngyán juǎn 中国语言地图集(第2版):汉语方言卷 [Language Atlas of China (2nd edition): Chinese dialect volume], Beijing: The Commercial Press, ISBN 978-7-100-07054-6. Coblin, W. South (2000), "A brief history of Mandarin", Journal of the American Oriental Society, 120 (4): 537–552, doi:10.2307/606615, JSTOR 606615. Handel, Zev (2008), "What is Sino-Tibetan? Snapshot of a Field and a Language Family in Flux", Language and Linguistics Compass, 2 (3): 422–441, doi:10.1111/j.1749-818X.2008.00061.x. Hudson, R. A. (1996), Sociolinguistics (2nd ed. ), Cambridge: Cambridge University Press, ISBN 978-0-521-56514-1. Hymes, Dell (1971), "Sociolinguistics and the ethnography of speaking", in Ardener, Edwin, Social Anthropology and Language, Routledge, pp. 47–92, ISBN 978-1-136-53941-1. Kornicki, P.F. (2011), "A transnational approach to East Asian book history", in Chakravorty, Swapan; Gupta, Abhijit, New Word Order: Transnational Themes in Book History, Worldview Publications, pp. 65–79, ISBN 978-81-920651-1-3. Lewis, M. Paul; Simons, Gary F.; Fennig, Charles D., eds. (2015), Ethnologue: Languages of the World (Eighteenth ed. ), Dallas, Texas: SIL International. Liang, Sihua (2014), Language Attitudes and Identities in Multilingual China: A Linguistic Ethnography, Springer International Publishing, ISBN 978-3-319-12619-7. Mair, Victor H. (1991), "What Is a Chinese "Dialect/Topolect"? Reflections on Some Key Sino-English Linguistic terms" (PDF), Sino-Platonic Papers, 29: 1–31. Matthews, Stephen; Yip, Virginia (1994), Cantonese: A Comprehensive Grammar, Routledge, ISBN 978-0-415-08945-6. Norman, Jerry (2003), "The Chinese dialects: phonology", in Thurgood, Graham; LaPolla, Randy J., The Sino-Tibetan languages, Routledge, pp. 72–83, ISBN 978-0-7007-1129-1. Sohn, Ho-Min; Lee, Peter H. (2003), "Language, forms, prosody, and themes", in Lee, Peter H., A History of Korean Literature, Cambridge University Press, pp. 15–51, ISBN 978-0-521-82858-1. Thomason, Sarah Grey (1988), "Languages of the World", in Paulston, Christina Bratt, International Handbook of Bilingualism and Bilingual Education, Westport, CT: Greenwood, pp. 17–45, ISBN 978-0-313-24484-1. Wardaugh, Ronald; Fuller, Janet (2014), An Introduction to Sociolinguistics, John Wiley & Sons, ISBN 978-1-118-73229-8. Zhang, Bennan; Yang, Robin R. (2004), "Putonghua education and language policy in postcolonial Hong Kong", in Zhou, Minglang, Language policy in the People's Republic of China: Theory and practice since 1949, Kluwer Academic Publishers, pp. 143–161, ISBN 978-1-4020-8038-8. R. L. G. "Language borrowing Why so little Chinese in English?" The Economist. 6 June 2013. Wikimedia Commons has media related to Chinese languages. Wikivoyage has a travel guide for Chinese phrasebook.